Technical issues may occur in most industries like in the aviation centres. In December 2013, technical issues at the air traffic control centre in Swanwick, Hampshire led to the delay of over 1,000 flights. As a result, over 225 flights were cancelled. It prompted the National Air Traffic Service (NATS) to take control of the situation and resolve the said issue [The Irish Times]. This incident highlighted the need to upgrade the current air traffic system and install rugged computers with reliable computer peripherals. And, amongst the most recommended industrial pointing device for this application is the TB38 Series Trackerball. This device has an IP65K stainless steel casing which ensures that it remains functional despite prolonged operations. Additionally, this metal enclosure’s sealing prevents the liquid chemicals used in standard wash-down procedures from damaging its internal circuitry. Thus, operators can expect to use an accurate peripheral device to effectively coordinate multiple flights. Technical issues are one of the root causes of flight delays. That is why air traffic controllers utilise a reliable computing equipment to manage the air traffic system effectively. So, apart from installing industrial-grade computers, these operators also integrate it with compatible peripherals. This is to ensure optimal ATC operations and reduce flight delay occurrences. Fortunately, the TB38 series can be installed on air traffic control PCs. It can function in temperatures ranging from -20oC to 60oC. Also, this type of pointing device can capably operate in areas with up to 95% non-condensing humidity. The TB38 series has a corrosion-resistant metal construction as well which prevents the rust from forming on the structure. Thus, operators can use panel PCs with a responsive peripheral device to address critical issues. The TB 38 pointing device also has additional features which make it ideal for industrial applications. Many air traffic control operations utilise similar device interfaces to ensure an accurate monitoring system. Therefore, the devices installed must be compatible with the system. But, the TB 38 trackball can be customised to have a USB, PS2, AT, RS232, and SUN interface. This wide compatibility range can make it easier for the operators to install specific air traffic applications￼. The trackball’s Phenolic resin material is specifically designed for industrial operations. It resists structural wear due to consistent usage. This device has also an expected lifespan of approximately >6 million ball revolutions as well. So, this feature makes it a great device for these kinds of applications. Using the TB38 Series trackball makes it easier for operators to navigate applications on PCs even in limited physical space. Its compact 38.1mm ball size means that it does not need a large surface area to function. Hence, space-restrictive areas such as air traffic control centres can make sure it can still function efficiently. Nowadays, technical issues in the air traffic control centre can cause multiple flight delays which will affect multiple passengers. 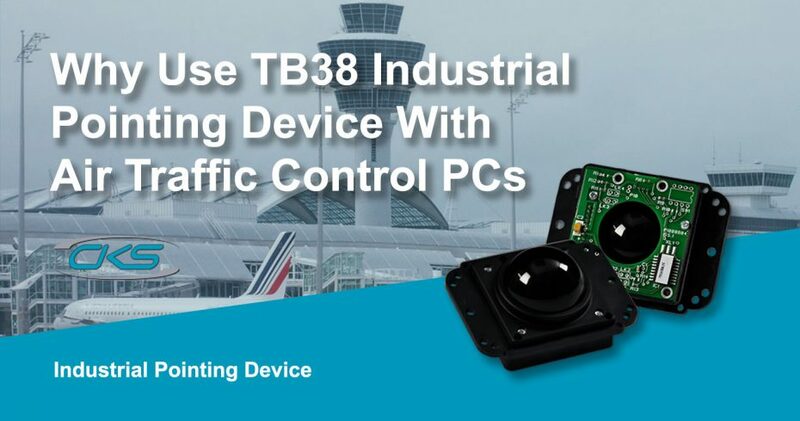 So, installing industrial PCs with the TB38 pointing device is a great solution for air traffic control and management system. Fast-track air traffic control operations today by installing the TB38 Series Trackerball to compatible industrial computers. Contact an industrial computer manufacturer for more details about these devices.